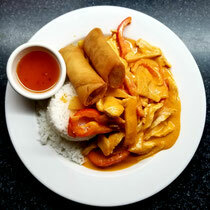 Gaeng Gai (Coconut milk in a Thai red curry sause with chicken, bamboo shoot and pepppers. Flavoured with Thai basil). 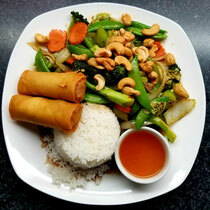 Served with vegetarian spring rolls, rice and daily soup. Phad Med Ma-Muang Jae (Roasted cashew sautéed with broccoli, onions, snap peas, peppers, carrots and celery). 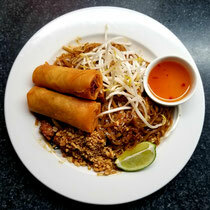 Phad Thai Jae (Rice noodles stir-fried with tofu, egg, green onions, spiced with tamarind sauce and chillies). Served with vegetarian spring rolls and daily soup.